For eleven years, Mr. Jones served as Qualcomm’s Vice President, Wireless Health Global Strategy and Market Development and founded Qualcomm’s digital health subsidiary. In 2011, working with the XPRIZE Foundation, he conceived the $10 million Qualcomm Tricorder XPRIZE for a consumer device capable of making multiple medical diagnosis. 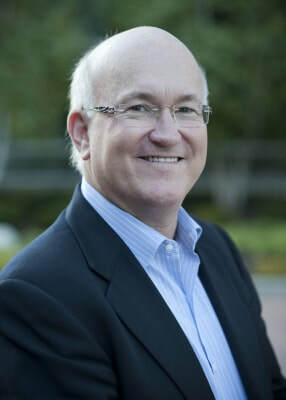 In 2005, he founded and was Chairman of the Wireless Life Sciences Alliance, which merged in July 2016 with HIMSS PCHA, forming the largest global connected health trade, standards, scientific and professional organization. Speaking engagements have included Milken Institute Events, Sanofi Board and Executive Committee, Novo Nordisk Board, Genentech Senior Executive Committee, Roche Global R&D, ResMED Board, JSR Executive Committee, J&J Innovations Master Class, Health Evolution Summit, Rutberg Wireless Influencers, IMEC, BIO, BioVISION, MIT Emtech, the MEMS Industry Group, MedMarc, 340B Coalition, Bayer Pharmaceuticals Executive Committee, the NIH Director’s Leadership and the world’s largest trade show, CES. He has been a member of the Milken Institute Advisory Committee on Biomedical Innovation. In 2005, he founded the Wireless Life Science Alliance (WLSA) and Convergence Summit, hosted by the CEO of Qualcomm and the Chief Scientific Officer of Johnson & Johnson. In 2010, WLSA launched the NIH based Scientific Conference on Wireless Health, the first academic symposium on Wireless Health. Jones was a member of the World Economic Forum Global Agenda Council on Digital Health. He is on the boards of SanguineBio, BioSense, Sentrian, Trice Imaging and the Alliance Healthcare Foundation, and for six years, the American Telemedicine Association. He has sat on the Roche Product Development Innovations Advisory Board, the Sanofi Consumer Products Innovations Board and the Genentech/Roche Trials 2 Patients Advisory Board. Jones was a founding board member of the West Wireless Health Institute (now West Health Institute) with the renowned, Eric Topol, MD and philanthropists, Gary and Mary West, raising over $130M. In 2010, the San Diego Transcript named Jones one of San Diego’s Top Influential ‘s and Fierce Health IT named Jones ‘One of 10 Disruptive Forces in Health IT’. In 2014 EvoNexus named Jones ‘Wireless Health Innovator of the Year’. Jones has spent over 35 years developing, founding and growing mobile healthcare enterprises. He served as chief operating officer of MedTrans (now American Medical Response), growing from $4.5 million to over $1 billion, into the world’s largest emergency medical services provider and physician practice, EMCARE. Jones was founder and Chairman of EMME, Mexico’s largest member-based subscription health service, and one of the largest medical groups in Latin America. He was senior vice president of marketing & strategy for HealthCap, a venture capital backed startup, which became the second largest US provider of women’s health. He was founder of OnCall Medicine, a pioneer in modern medical house calls. Jones has extensive experience in mergers and acquisitions with the MedTrans, AMR and EMCARE emergency physician industry rollups, involving more than 130 acquisitions (now Envision Health, EVHC NASDAQ). In the early 1980’s, he conceived and developed the $3 billion critical care medical transport sector. During the mid 80′s and into the 90′s he won billions of dollars of multi-year EMS contracts throughout the US. In the mid 1990’s he developed AMR’s healthcare call center strategy, American Medical Pathways. Jones is a founding advisor of Golden Hour Data Systems, an information technology and revenue cycle management company, managing over $3B in aero-medical revenue. In 1998, the Director of the US National Highway and Transportation Safety Administration asked Jones to co-author the Federal Government’s EMS Implementation Guide for the Future. In 2000, the Journal of Emergency Medical Services named Jones ‘One of the 20 Most Influential People in EMS’. Jones has been a guest lecturer at UCSD Rady, USC Marshall, USC Keck School of Medicine Center for Body Computing, UCLA Anderson, UCSF Center for Digital Health Innovation, Singularity University, Carnegie Mellon, the London School of Business, the Keck Graduate Institute at the Clairemont Colleges, and the Case Western University School of Engineering. He co-founded masters degree program for physicians in wireless health at The Scripps Research Translational Institute and a masters degree in wireless health for engineers at Case Western Reserve University. Jones holds a bachelors’ degree in biology and bioengineering from the University of California, San Diego, a Juris Doctor from the University of San Diego and an MBA from the University of California, Irvine. Jones has 5 issued and multiple pending patents in the use of wireless technologies.